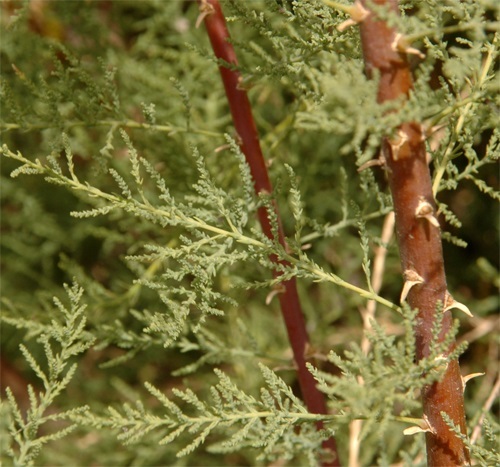 Tamarisk species, also called saltcedars, originate from Asia and were introduced to North America in the 19th century. Saltcedars have been used for soil stabilisation, as ornamentals, and wind breaks. All species have the potential to invade riparian areas. They draw enormous amounts of water from the soil and increase soil salinity which makes their surrounding unsuitable for native plants. There are several saltcedar and tamarisk species that are extremely similar and difficult to distinguish from one another. Therefore, we have combined all three species that are regulated in Alberta. Saltcedars are very unique, feathery-looking deciduous trees that grow up to 6 m tall. All species have bright pink or sometimes white flowers and scale-like green leaves (similar to cedar leaves). Due to the difficulty in identifying particular saltcedar species, it is recommended that all sightings are to be reported.